Combating the lack of sufficient skin collagen, because of skin aging, and replacing it with new Collagen, is one of the most effective ways to treat the skin and lessen the appearance of wrinkles. 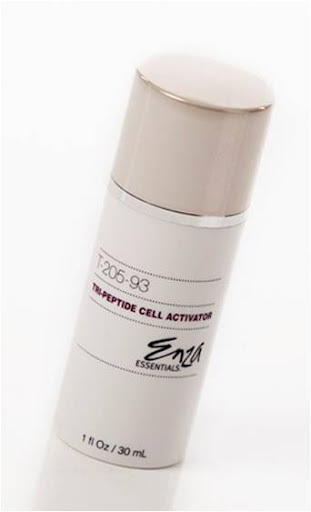 A Comprehensive study of the wrinkle reduction properties of Enza Essentials Tri-Peptide Cell Activator #205-93. The primary goal of this study was to evaluate the degree of wrinkle reduction experienced by 50 women over an 8-month period with daily application of our product. Each participant used a standardized approach to application of the product on a daily basis and was then evaluated every 2 weeks by a medical professional and photographed that same day. At the conclusion of the 8-month period, an analysis was done to incorporate any and all wrinkle reduction effects of the product.. All of the subjects tested indicated excellent improvement in skin quality, wrinkle reduction, and skin tone. Study description: Perspective clinical study of wrinkle improvement in 50 subjects from September 2011 to February 2013 conducted at the Plastic Surgery Clinic of Eau Claire, Wisconsin, USA under the direction of Joseph W. Rucker, MD. Study objective: Test the wrinkle reduction property of Enza Essentials Tri-Peptide Cell Activator and secondarily to do an objective evaluation of the ease of application, scent evaluation, and consistency of product. Stem cell culture extract (Malus domestica or fruit stem cell culture extract) –a rare Swiss apple is incorporated in this serum that has special longevity properties. The apple stem cell ingredient that has been developed prohibits the skin’s stem cells from aging. Tripeptide activator (Palmitoyl tripeptide – 3 advanced peptide)—the first tissue growth factor booster on the market, clinically proven to minimize fine line wrinkles while enhancing skin firming and moisturizing properties. Structure of the study: 50 candidates were selected based on age, skin type, and lifestyle. All participants used the product under standardized guidelines with periodic follow-up and assessment of wrinkle reduction improvement as noticed by subject and clinical examination, utilizing the Fitzpatrick Wrinkle Score assessment, by the author. All agreed to participate in photographic documentation beginning 2 weeks after first using the product and every 2 weeks thereafter for 8 months. Participants were instructed to follow a prescribed daily routine. Evaluation of Wrinkle Reduction: In addition to the above patient survey, all patients were subjected to a wrinkle improvement evaluation, utilizing the Fitzpatrick Wrinkle Score Assessment Protocol. All patients showed a significant reduction in the Fitzpatrick wrinkle score improvement in skin texture as a result of the treatment. The average starting Fitzpatrick wrinkle score for all patients was between a 2.5 to 3 and decreased to an average of 2 at 2 months, and decreased to an average of 1.5 at 8 months. The wrinkle reduction properties of stem cell and tripeptide products have been well established. At Enza, we sought to boost the effects of proven ingredients through a proprietary formulation of the percentage of each of these components. The power of our brand of stem cell technology, tripeptide regeneration and antioxidant effects on wrinkle reduction, skin tone improvement and skin rejuvenation were as anticipated. The character of our product offers deeper penetration and therefore more effective ongoing collagen regeneration differentiating Enza among other currently available skin care lines. Does Popping Pimples Cause Acne Scarring?